T RP Series pump is two-stage oil sealed rotary vane vacuum pump and is a new concept out of routine of conventional design to satisfy customers needs for achieveing high vacuum, great throughput, easy installation, operation and maintenance. I t is designed for all the high to low vacuum application such as for laboratory, Semiconductor industry, TV bube pumping, analytical instruments, light bulbs, fluorescent lights, distillation, freeze drying and all the other vacuum application works. I t consists of oil anti-suckback valve and gas ballast valve for protecting pump, pump housing, top cover, motor, rotor being eccentric in cylinder inside of oil casing, vane, midcover, rear cover, etc forming pump body and the other parts. 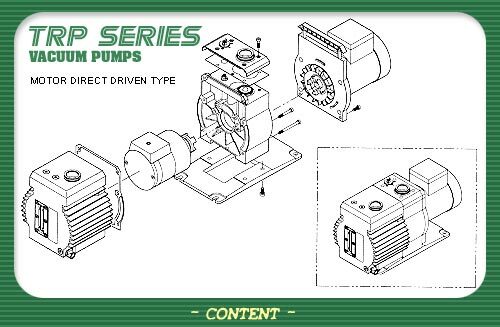 T he operational principal of the pump is based on that the pump and motor are connected by flexible coupling and as the motor rotates so does pump rotor. As the rotor rotates, two vanes in rotor vane groove turn and making contact with the internal surface of the cylinder due to centrifugal force. The gas drawn through dirt trap in the intake passes the oil anti-suckback valve and streams into the pump cylinder. As rotating vanes and is confined between the vanes and moving towards the exhaust valve. As the front vane passing the exhaust channel, the gas is being compressed and fully compressed gas oens the exhaust valve and exhausted through exhaust port. For lubrication and tight sealing, oil is supplied to the cylinder inside and vanes, rotor vane groove and vanes, and other moving area. Employing new material (high quality continiously drawn cast iron bar), completely eliminated the imperfection in vacuum pressure caused by casting defect or blowhole in the cast material. So it is possible to obtain high vacuum and large throughput. 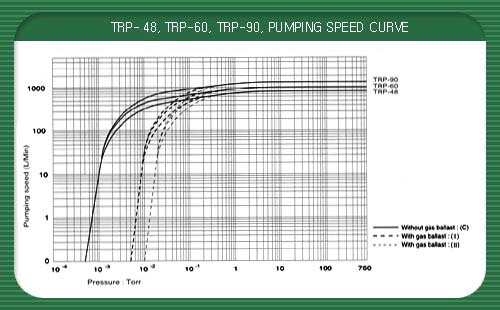 The function of the oil anti-suckback valve designed specially for TRP series is to protect vacuum system perfectly from oil and oil mist in the vacuum pump back streaming to the system when the pump happens to be stopped unintentionally or when restarting the pump. When the pump turned off due to unexpected power cut or other malfunction, the anti-suckback valve located in the inlet port seals the inlet port immediately to prevent vacuum. When the pump restarts as the pump structure keeps the vacuum, the anti-suckback valve once sealed off the inlet port opens slowly preventing the oil and the oil mist backstreaming to the vacuum system because of the pressure differece. 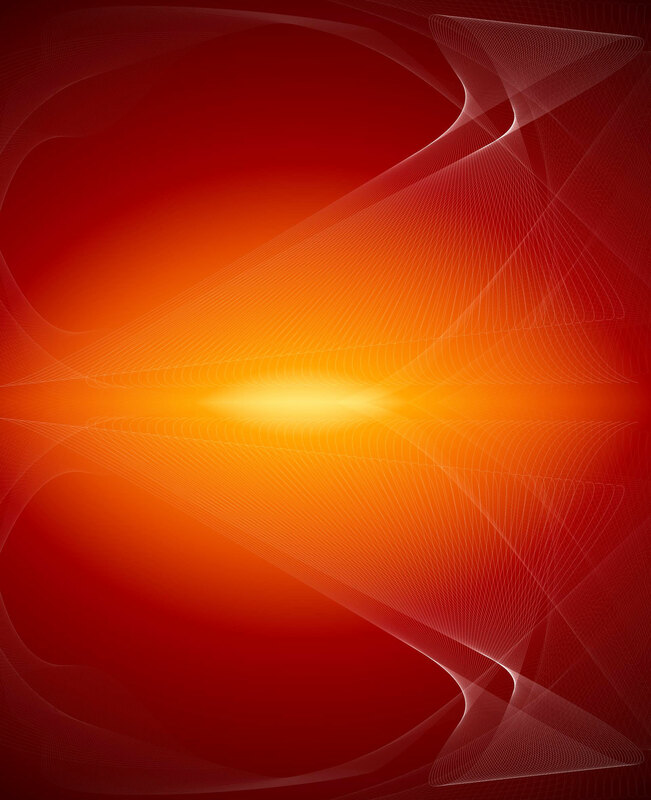 The operational principle of the valve is, the oil transfered by the oil pump enters the hole (A). then push a dumping valve 10 supported by a spring by oil pressure, separates oil channels b and c. Then the oil entered pass through a gap channel (B) then enters a hole (C) filling up the space a then the oil pressure presses a spring 7 downing the valve slowly opens the inlet port. When the pump stops as the oil pressure abruptly decreases, the dumping valve moves towards the hole (A), channel b and c reconnected and the anti-suckback valve immediately operates by inside of the pump vacuum. The oil in the space a pass through channels b and c then streams into channel e and f.
Using "quick clamp" on inlet and outlet port which conforms ISO standard, install or remove a pump to a vacuum system with ease in a short time. With a special attention on the noise level on workshops, the pump was designed for very low noise level. Noise from the pump structure was reduced to the minimum by designing pump cylinder and vanes in idealistic geometrical form. Prevents noise by using rubber connection coupling between pump and motor, shock absorbing parts on pump base. Gaskets between pump cylinder and pump housing, pump housing and motor housing reduce the noise. No noise from bearing as it is of a forced oil supply & lubricating method sliding bearing. 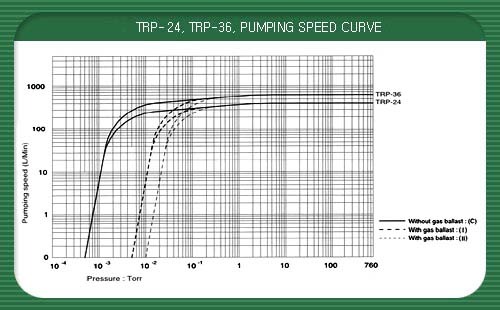 TRP series is equipted with gear rotor oil pump producing high pressure which ensures perfect oil circulation. The system as shown in the figure below, when the oil pumped by the oil pump fills up two oil channels, the oil pressure formed inside one channel controls the anti-suckback valve and the rest of oil pass through the over pressure valve supplying the oil to shaft seal and the sliding bearing in the front cover and return to oil reservoir. And also on the other channel the oil strongly pushed by the oil pump supplies the oil pump to the pump cylinder and sliding bearings without fail for lubrication and sealing and return to the oil reservior through the exhaust valve. This system ensures to prevent friction parts free from wearing and jamming due to poor oil supply and the system enables to operate pumps in low vacuum operation continuously. Gas ballast valve control has three steps (C:closed l:low flow II:high flow) for easy choice even a pump is in operation. The gas ballast valve means the self cleaning ability of the pump and removing condensable gases from oil by supplying fresh gas to the 2nd cylinder of the pump to prevent mist being condensed. To protect the pump from superficial corrosion, the material for pump housing, top cover and oil casing is aluminum. And stainless steel is used for inlet port, outlet port and exhaust valve. parts for sealing and gaskets are also corrosive gas resistant. Using high quality continuously drawn cast iron bar for cylinder, covers and rotors eliminate the imperfaction in vacuum pressure caused by casting fault or air bubble trapped in the cast material. Oil level sight glass, oil intake and oil drain port are placed at one side of the pump for convenient checking and pump handling. Also attached oil drain valve at the oil drain port for easy draining and the valve can be used in two directions as required for your needs. Pumps up to the size TRP-36 have portable carrying handle for easy carriage of the pump and after transportation when you release the handle, it goes back to its original position. 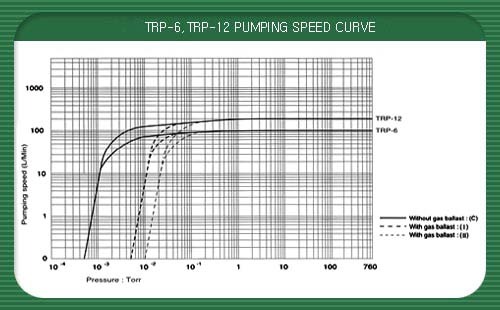 TRP Series pumps were designed in three major product series such as (1)TRP-6, TRP-12, (2)TRP-24, TRP-36, (3)TRP-48, TRP-60, TRP-90 Through this system many parts in the same series can be commonly used. For example, pumps in the same series use same pump housing. This design principle enables more economical production, simplifying spare parts stocking and good compatibility of parts. Assembly and disassembly of the pump can be done quickly and does not require any special tools and training. By this design principle, without complete disassembly you can replace a shaft seal or adjust it and when the pump is disassembled in the pump cylinder the rotor automatically maintains its centre for easy assemply and also gauranteed service kits are available.